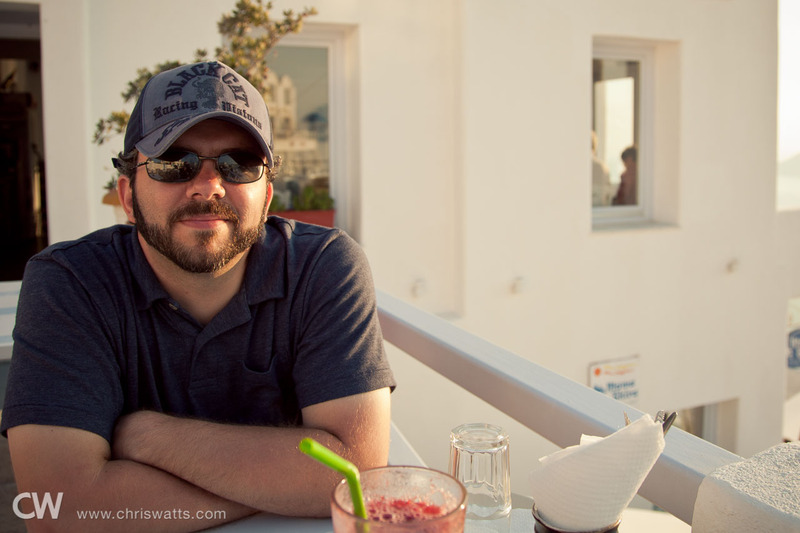 This is part 3 of 4 of Our Honeymoon In Greece. 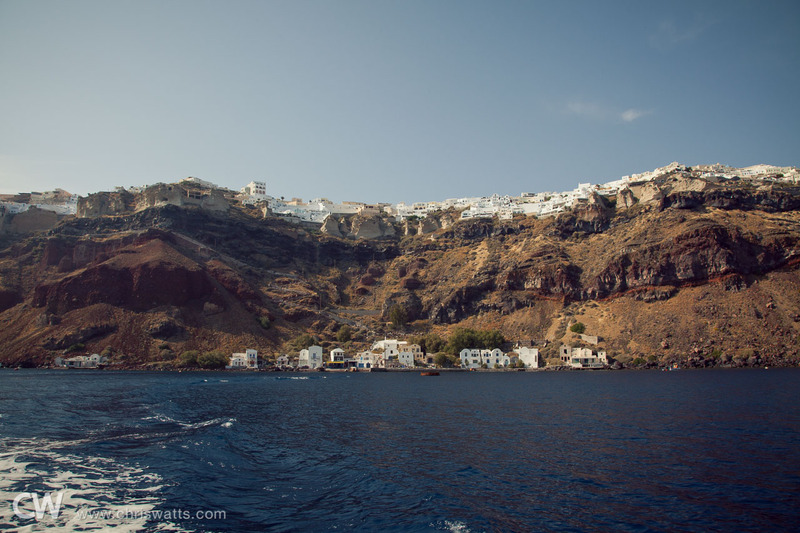 After a few days in Mykonos, which was the highlight of our trip, it was time to take another ferry - this time, a catamaran-style, high-speed ferry - to the island of Santorini, our home for the next three nights. 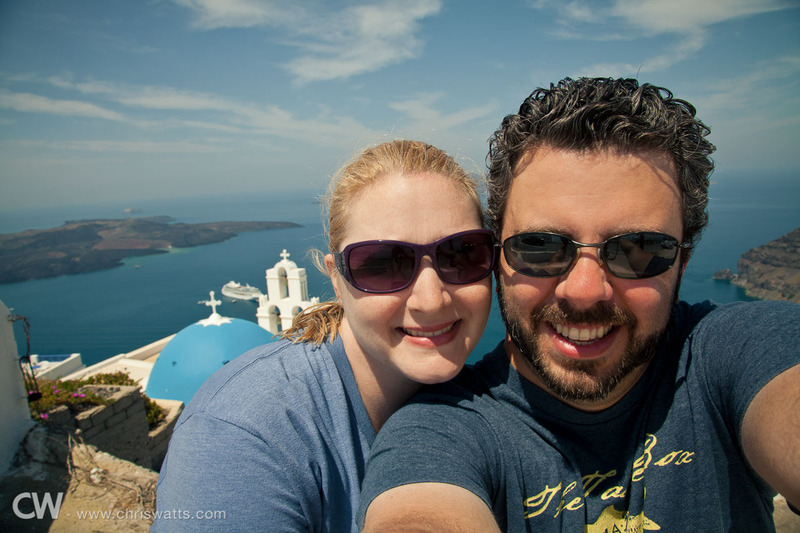 Santorini was the reason we wanted to take our honeymoon in Greece. 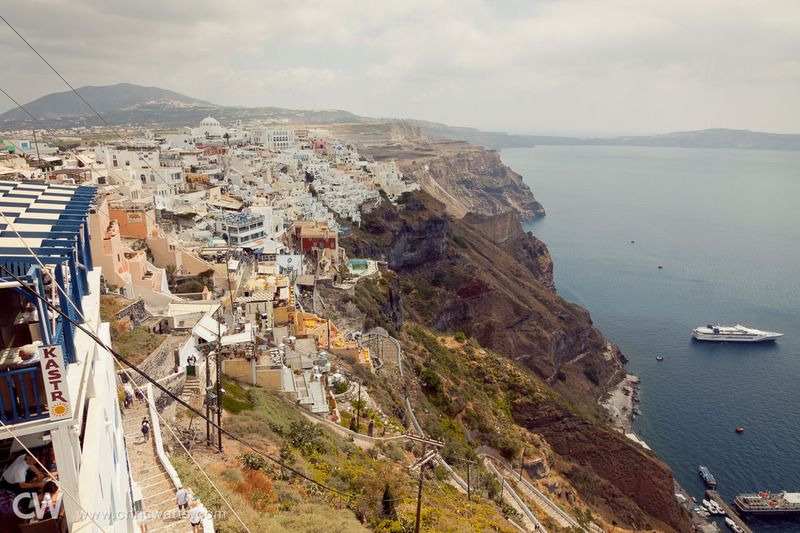 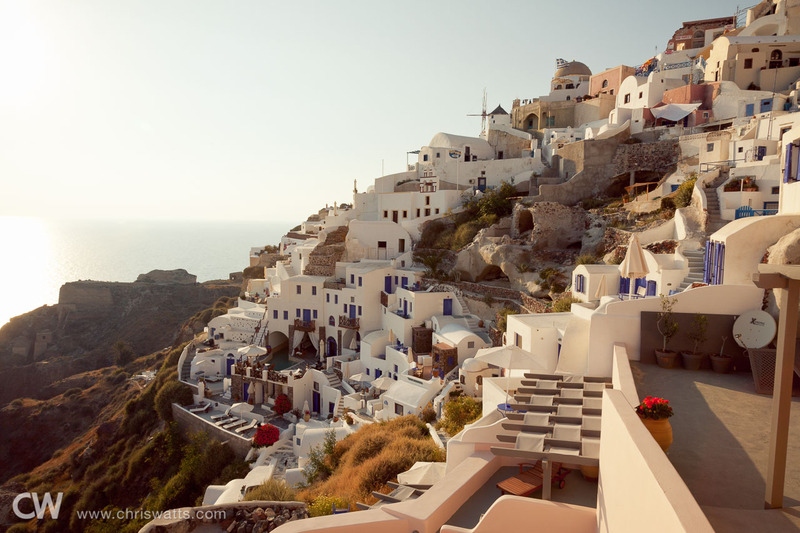 When people think of Greece, they’re probably thinking of Santorini; it’s an iconic destination. 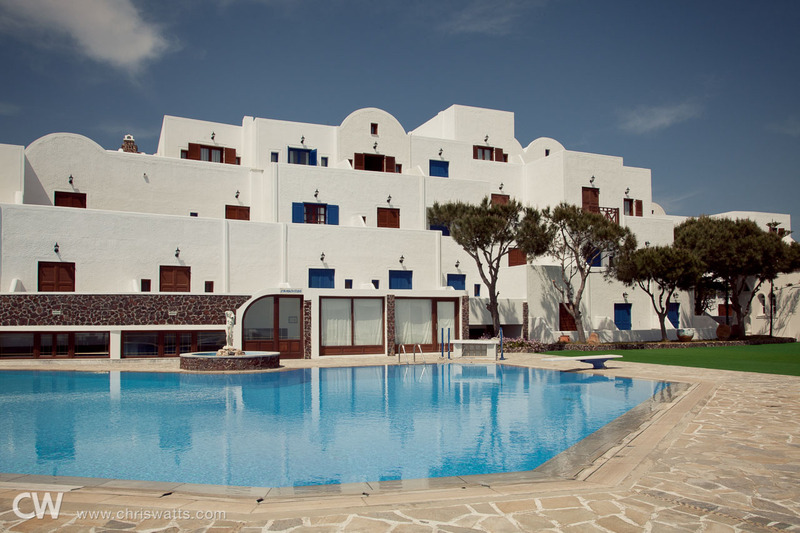 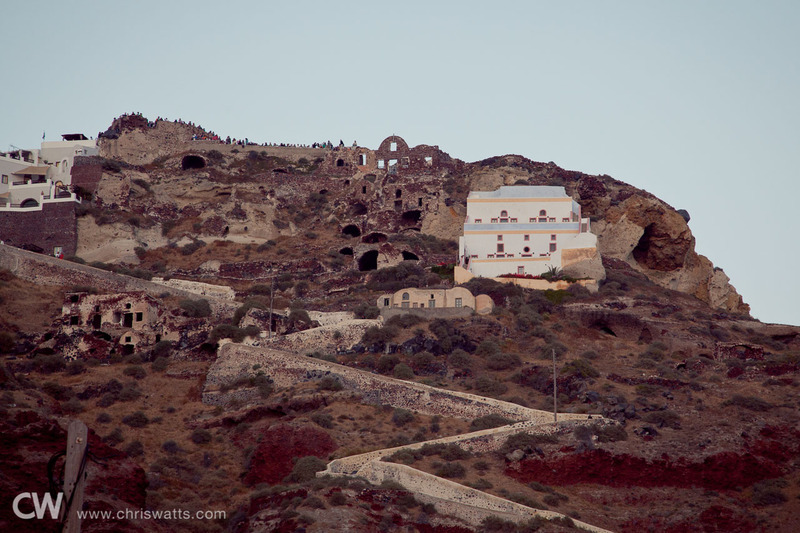 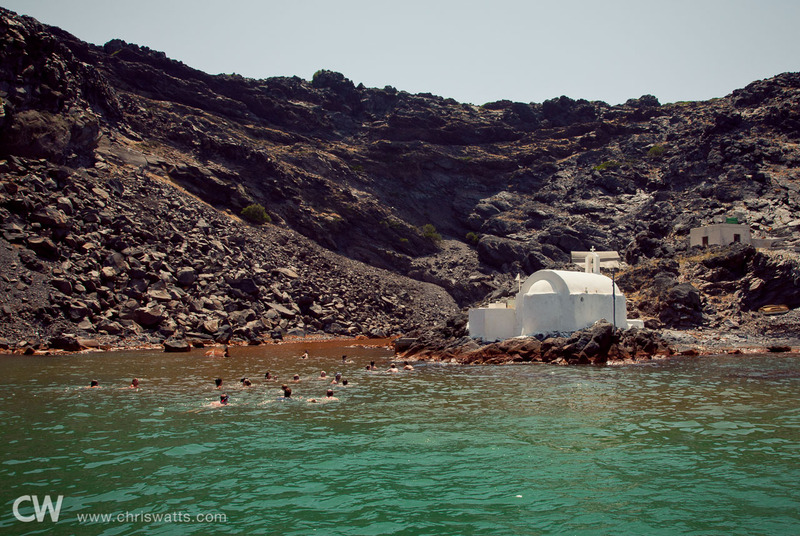 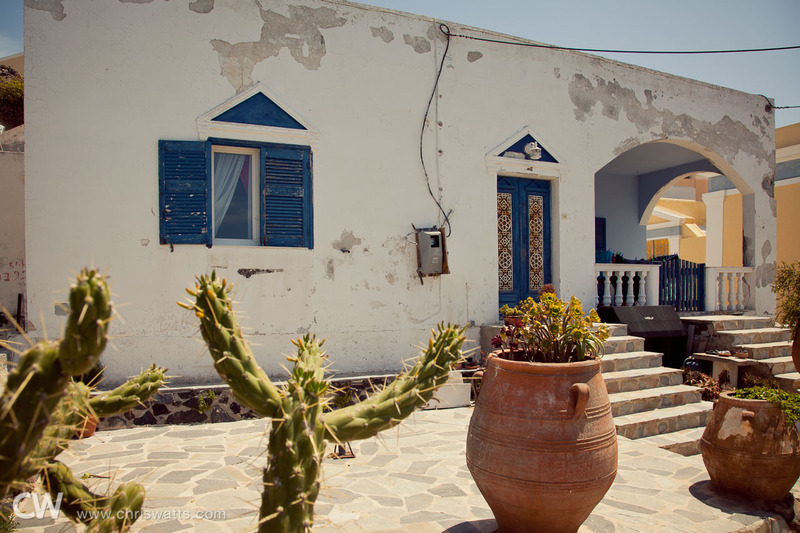 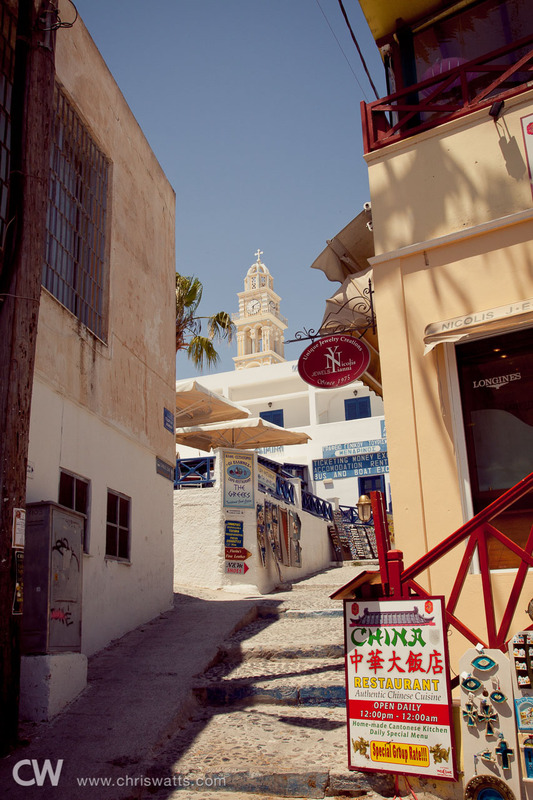 While our time spent there was amazing, the lesser-known Mykonos was a bit more appealing, overall. 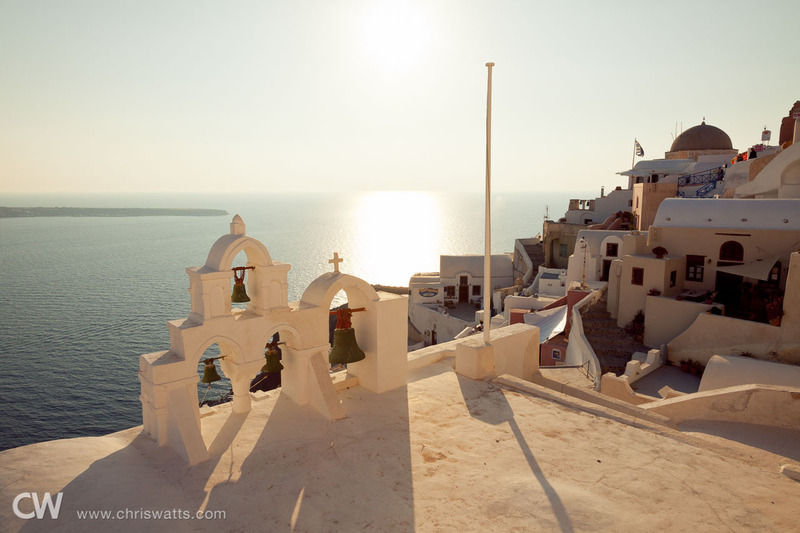 For us, if Mykonos were a 10 on a scale of 1 to 10, Santorini would be a 9. 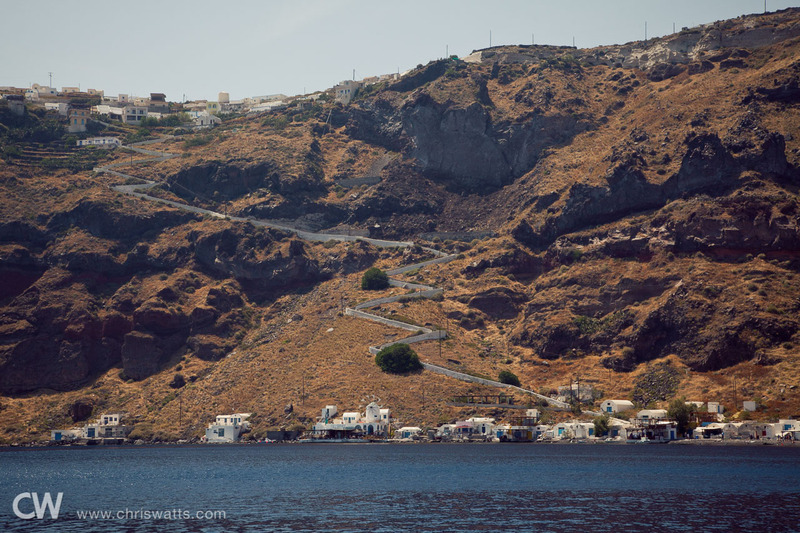 We discovered that our hotel in Santorini was on the “wrong” side of the island, the side opposite the caldera, but it offered amazing views, nonetheless. 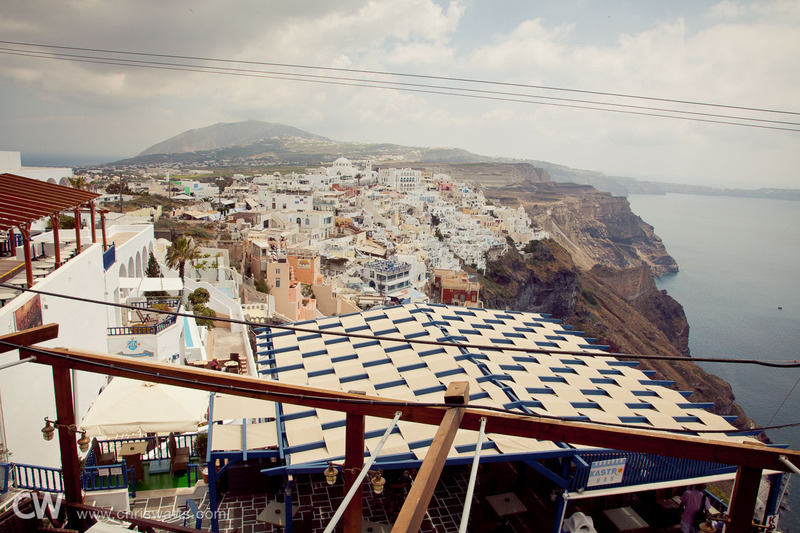 The view from a local restaurant where we stopped for lunch. 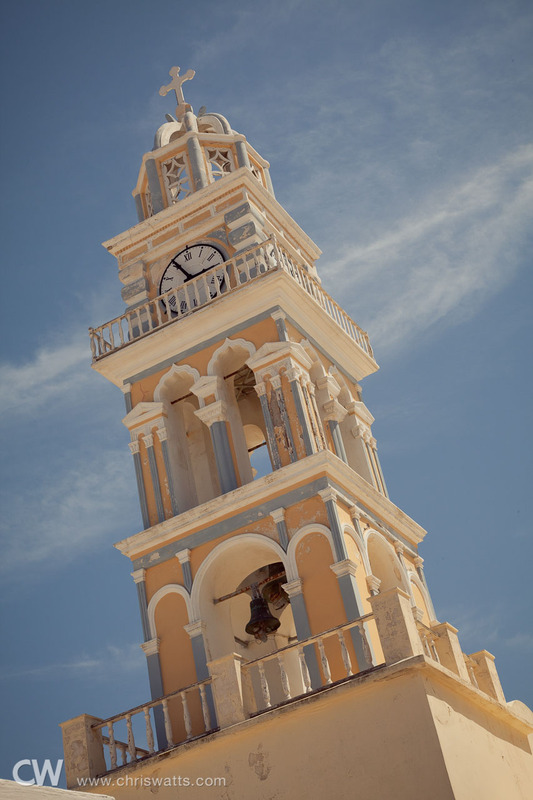 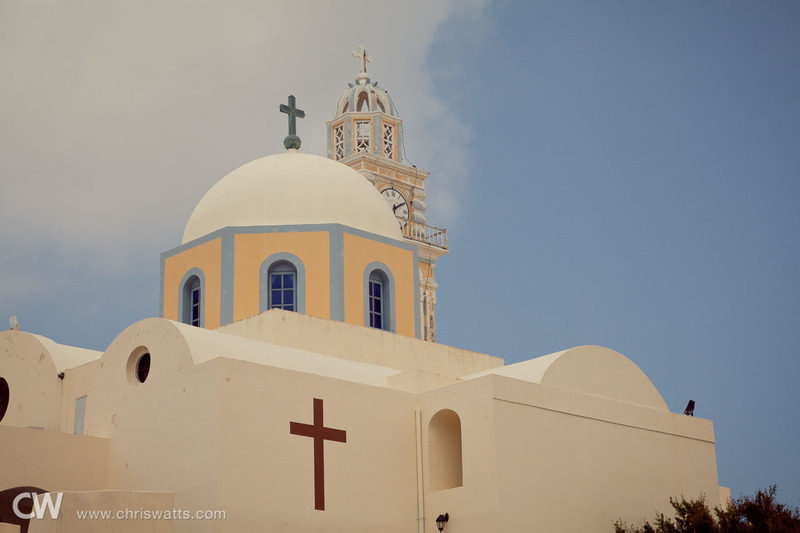 The Catholic Cathedral of Santorini. 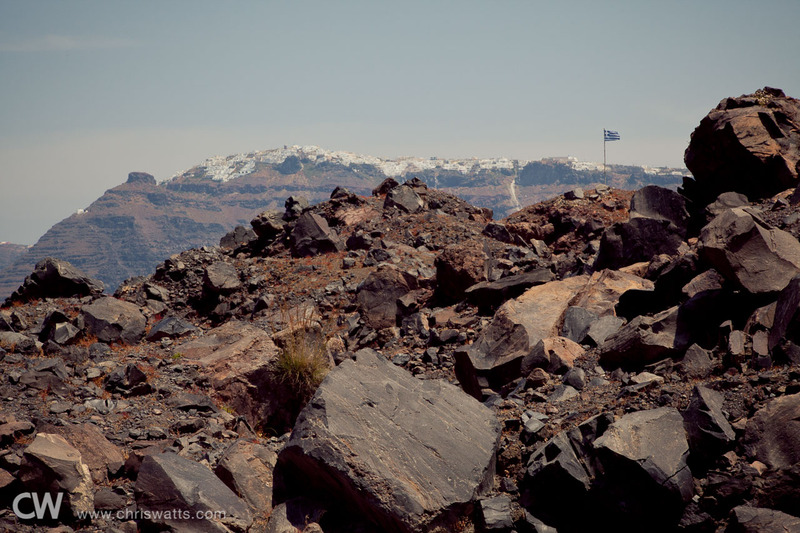 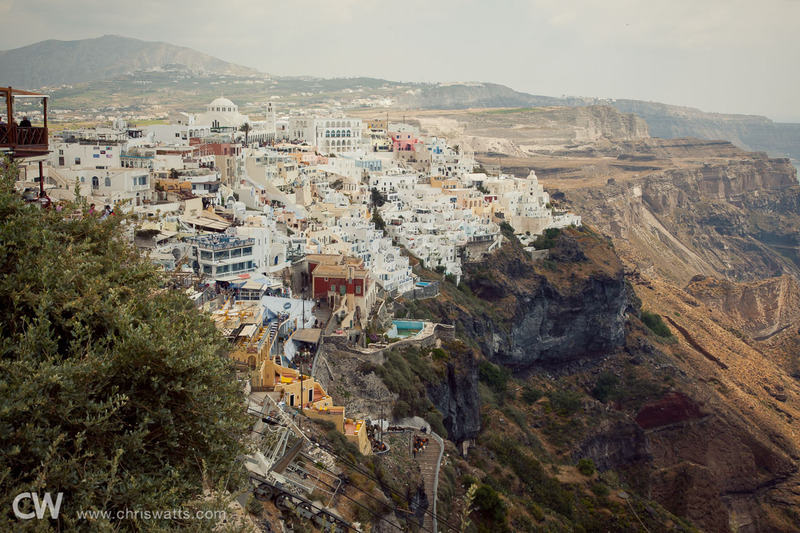 Thera, precariously perched high above the caldera below. 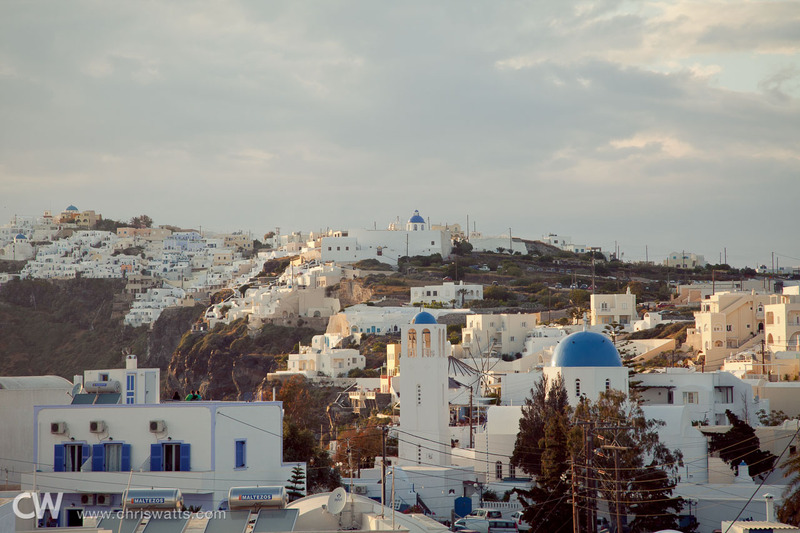 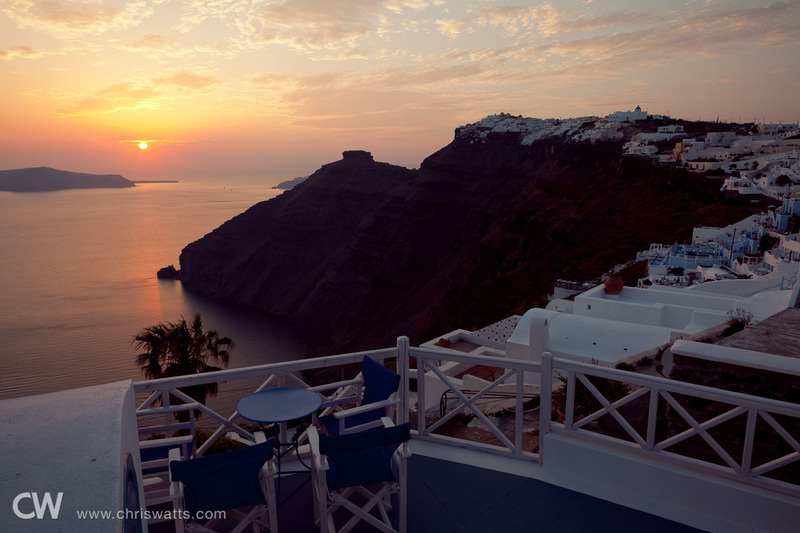 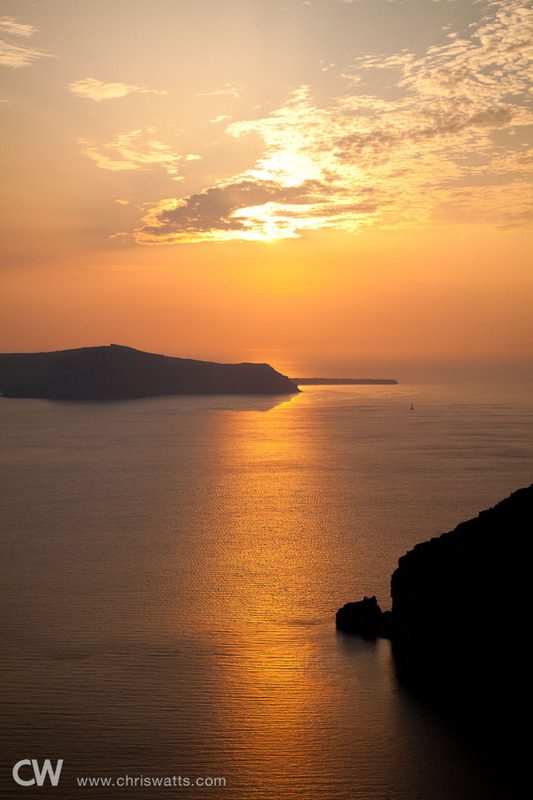 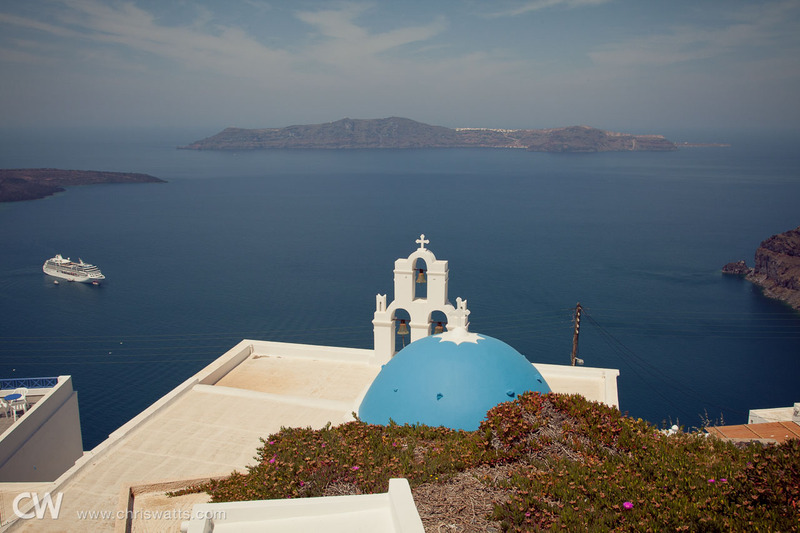 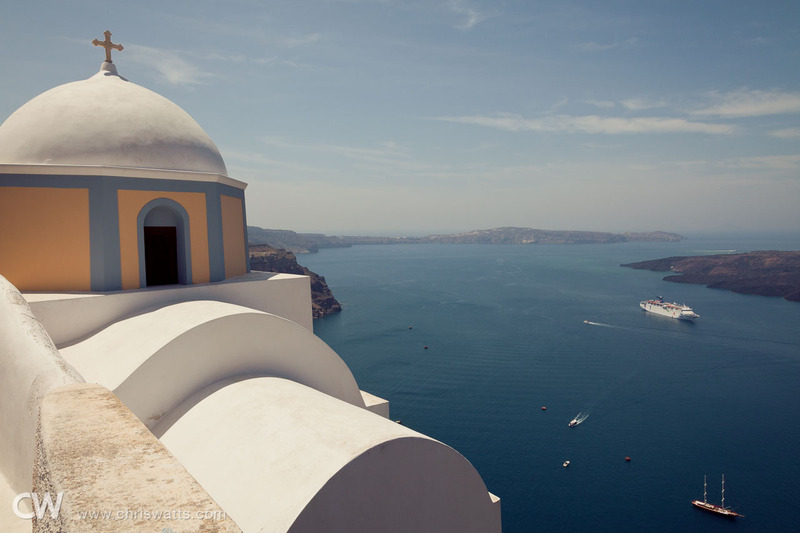 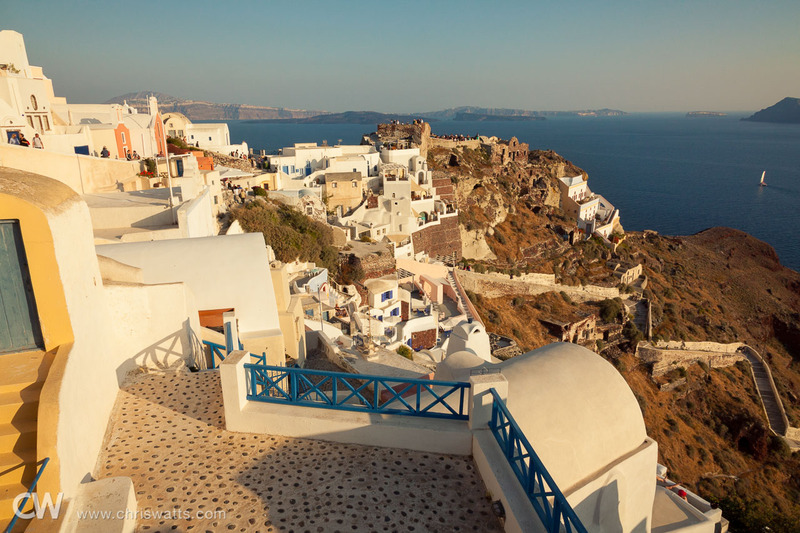 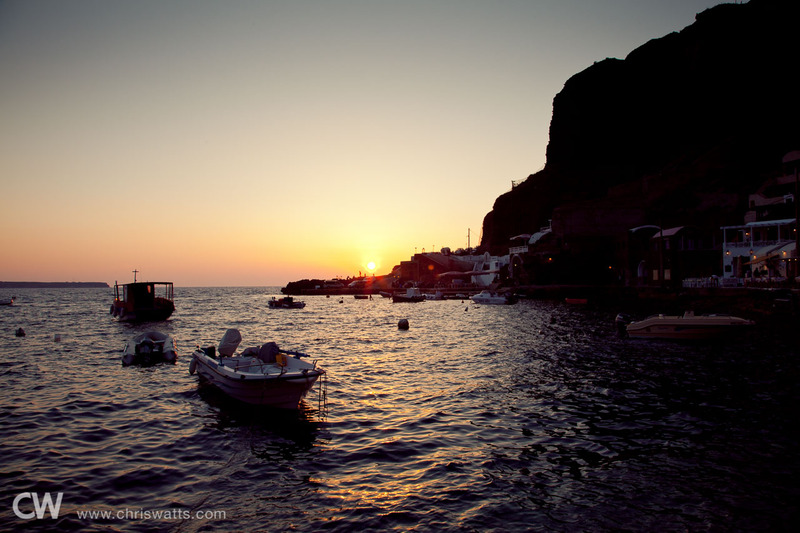 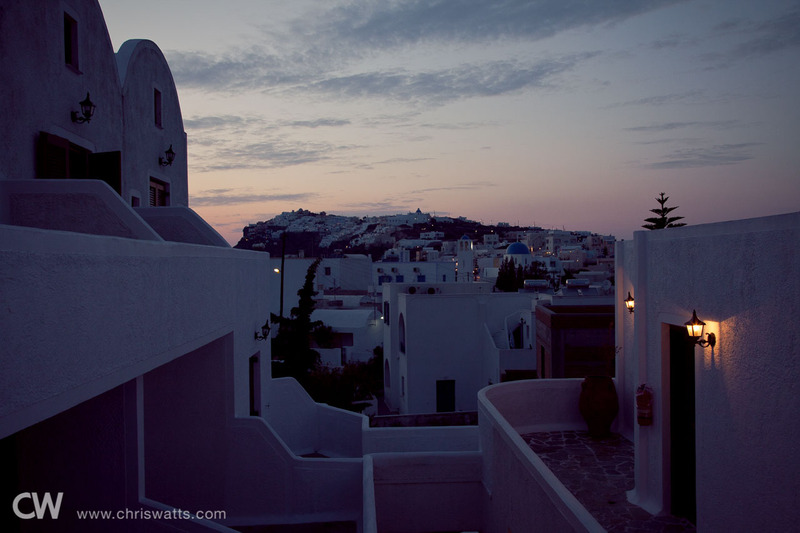 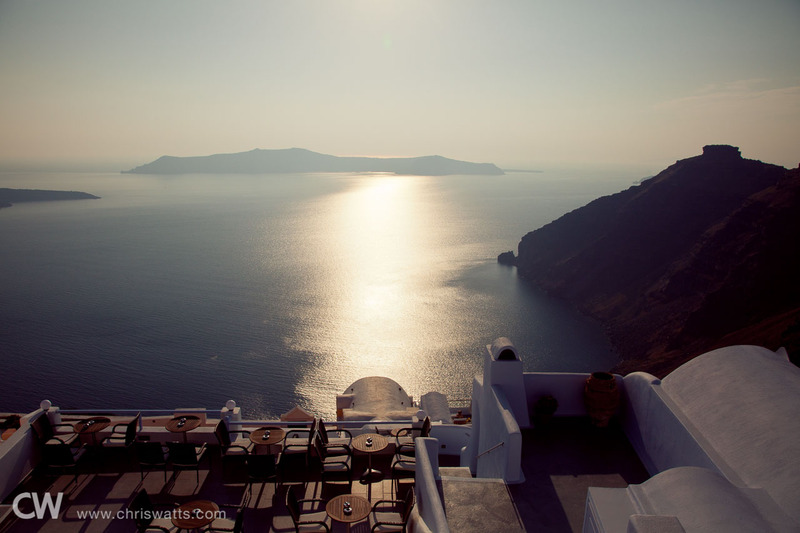 We had heard from some other travelers that Oia offered the best sunset views in Santorini. 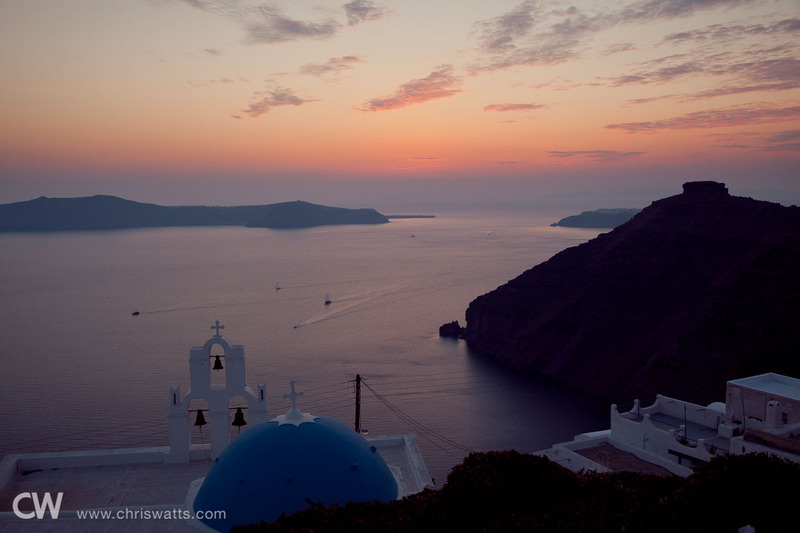 We joined another couple for dinner there one night, which meant walking from the top of the island, all the way down to sea level while trying not to concern ourselves with how we were going to get back up. 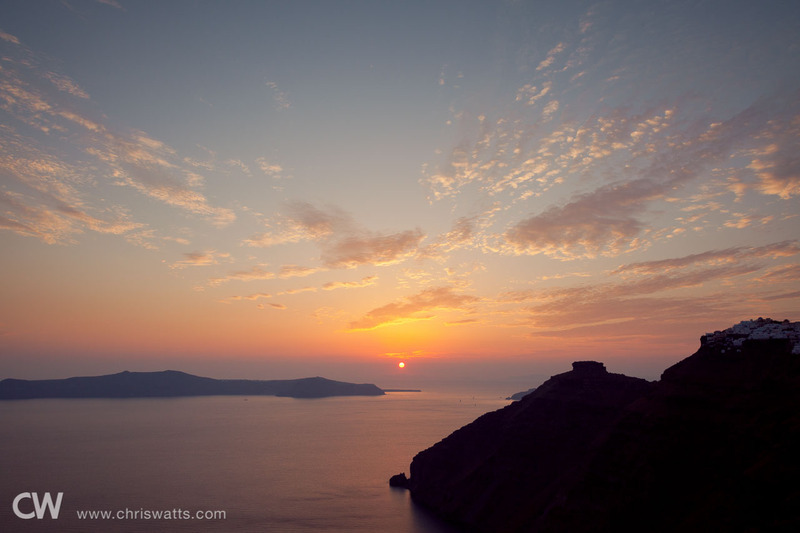 We were a little let down, to be honest, but the sunset views we were treated to the following night more than made up for it. 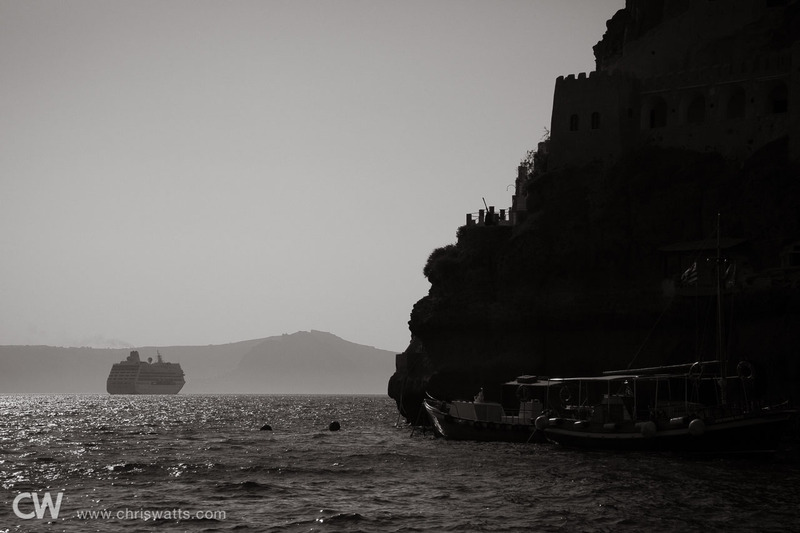 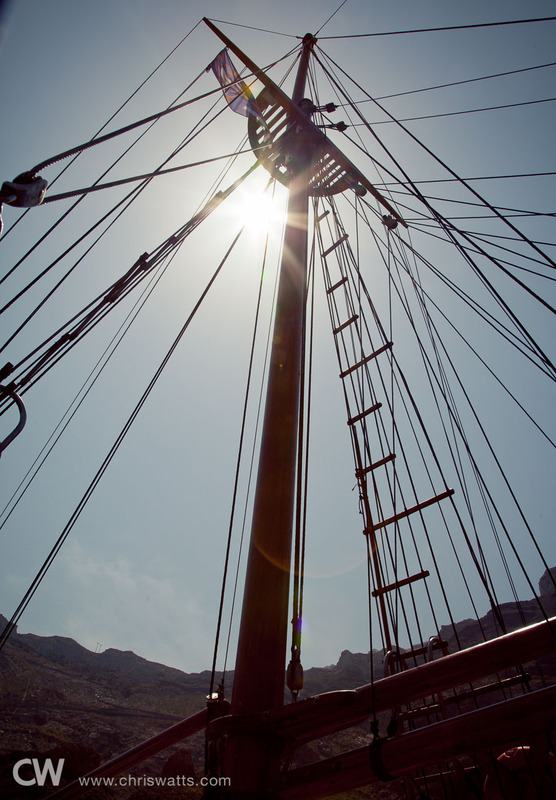 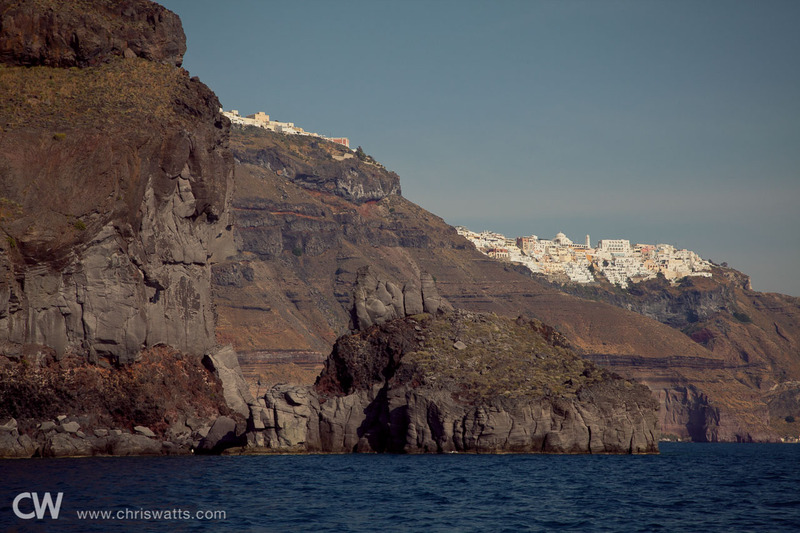 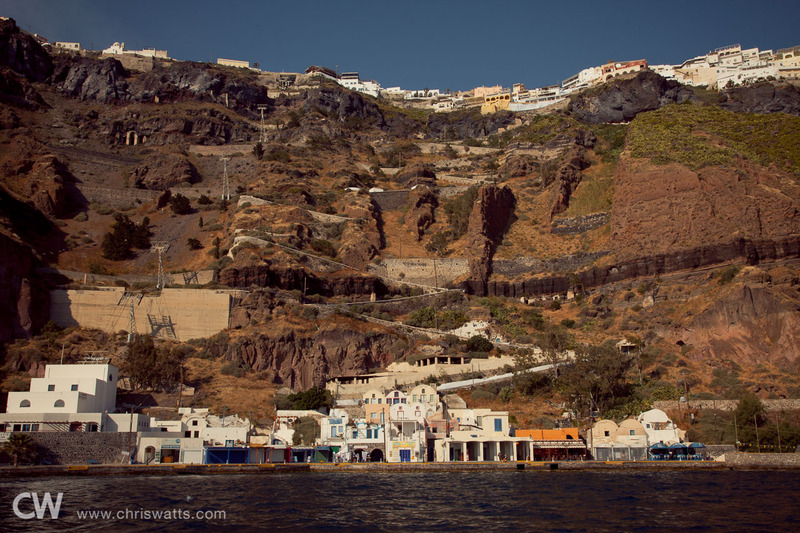 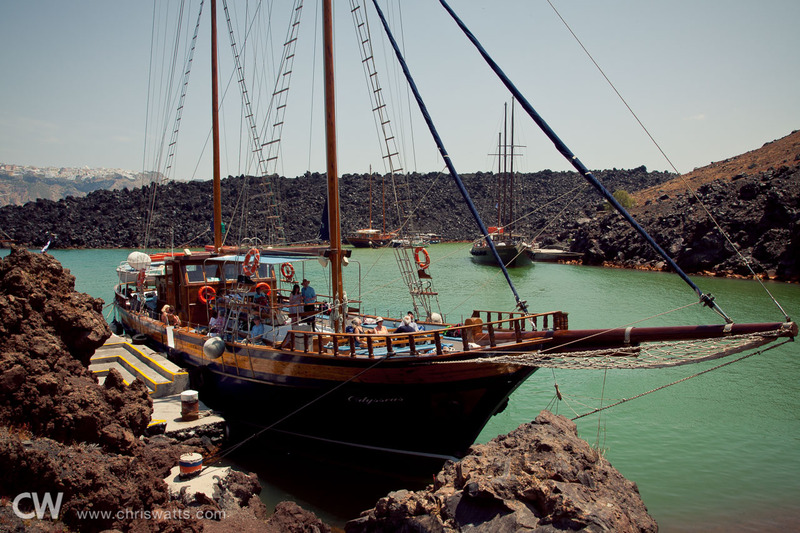 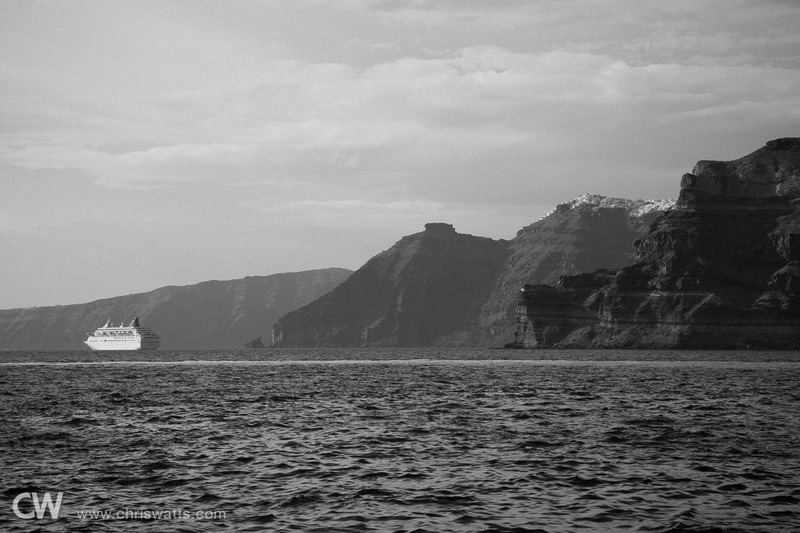 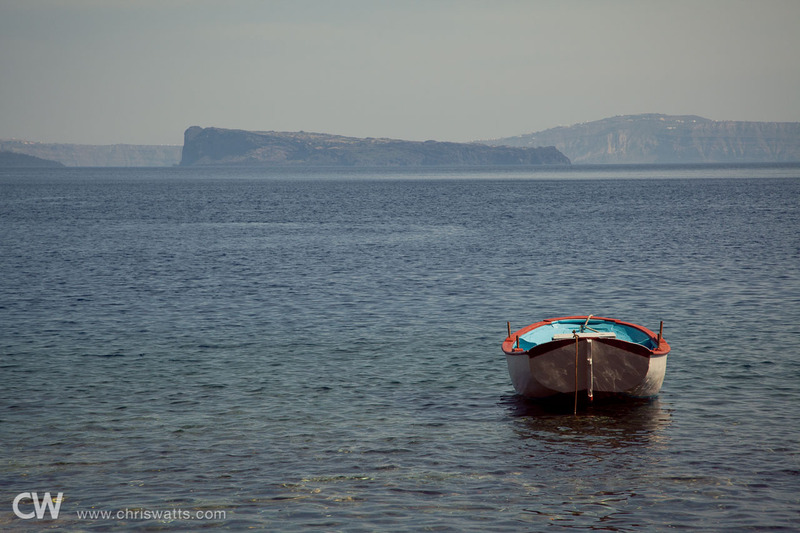 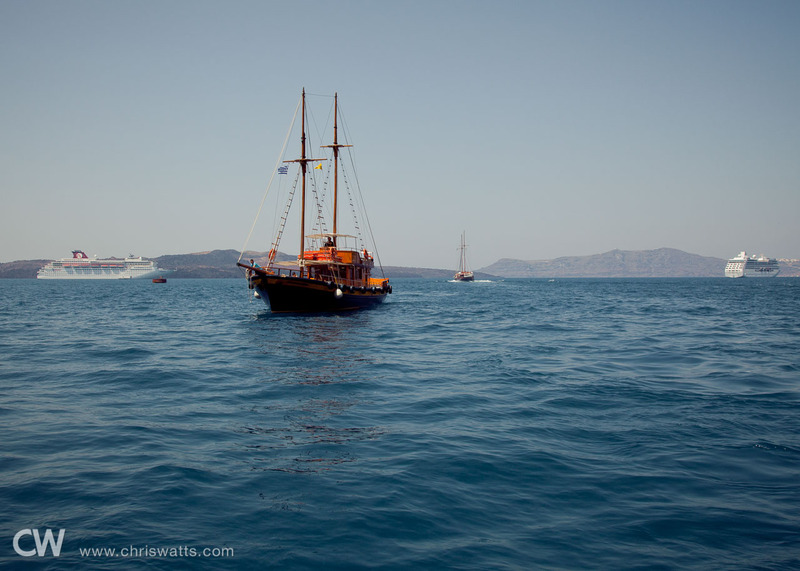 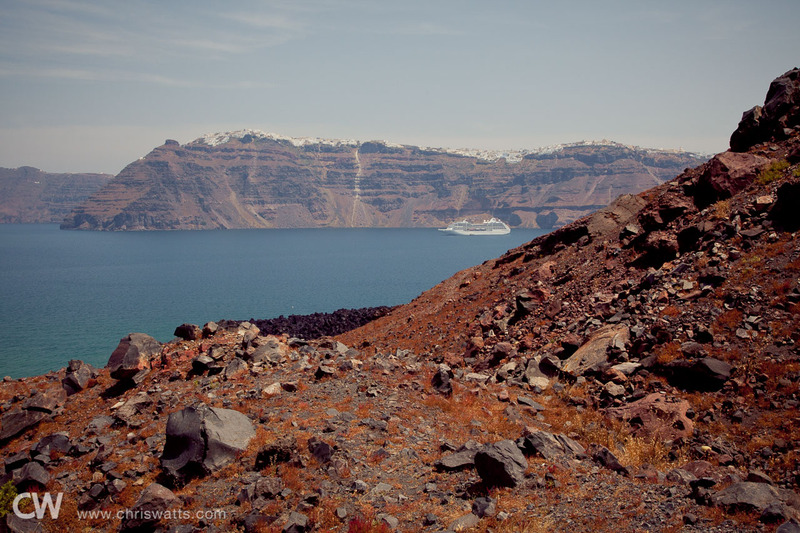 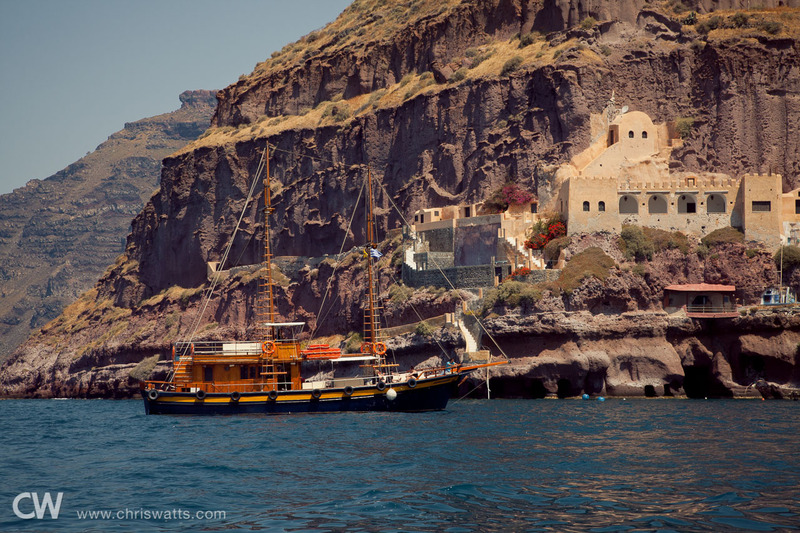 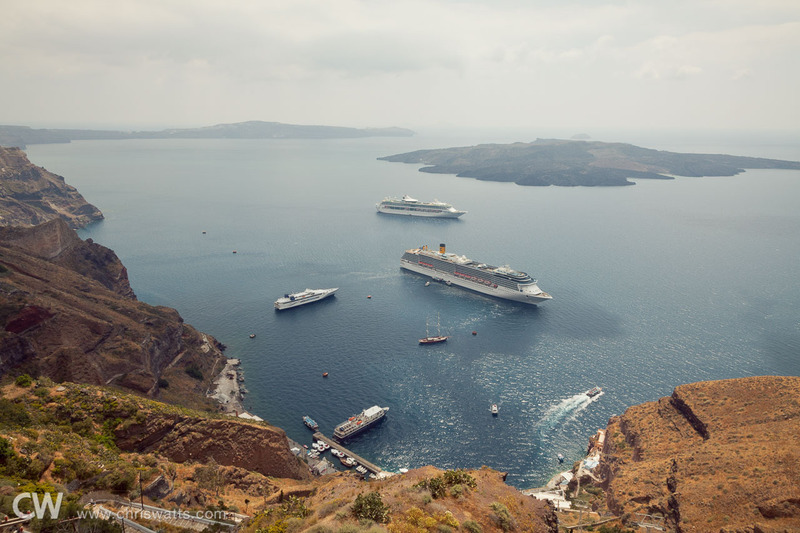 The following morning, we embarked on a day-cruise tour of the caldera. 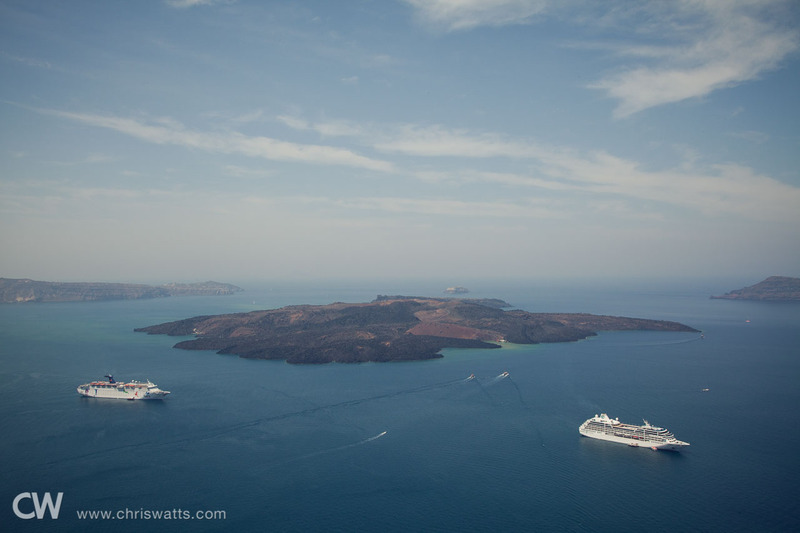 The main stop on our caldera day-cruise was the still active volcanic island at the center of the caldera. 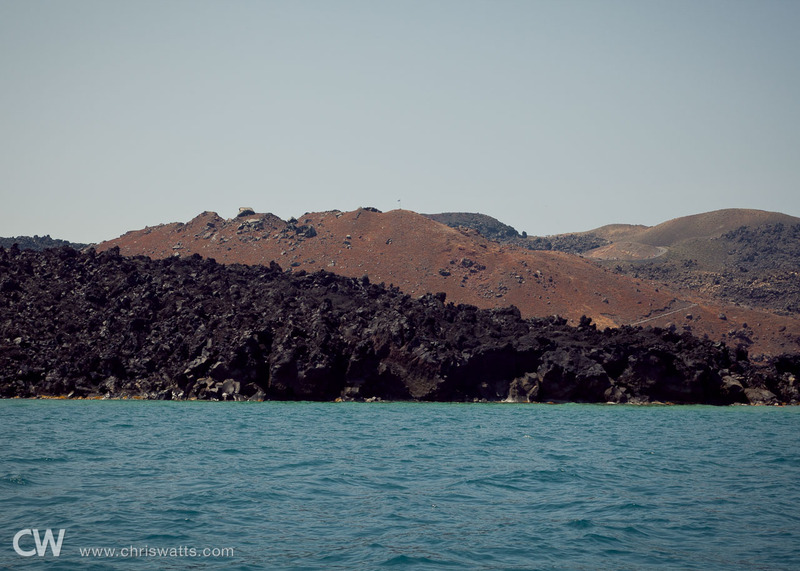 The next stop on our caldera day-cruise was a (very) small island featuring a hot-spring lagoon. 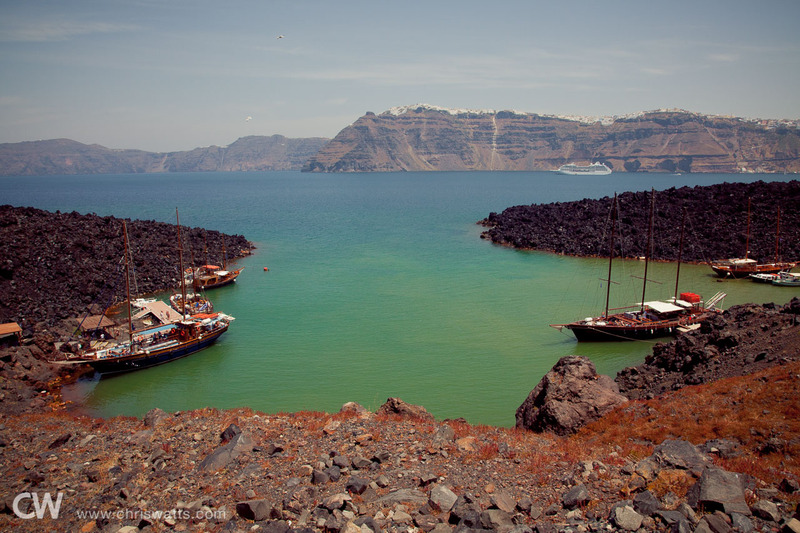 Unbeknownst to us, tour-goers were allowed to jump off the boat and go for a quick swim, but alas, we were unprepared. 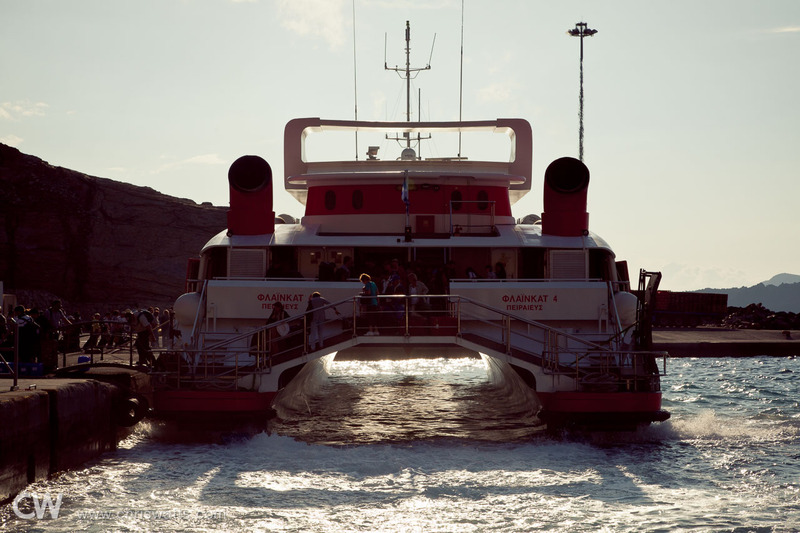 Next stop, another small island for lunch. 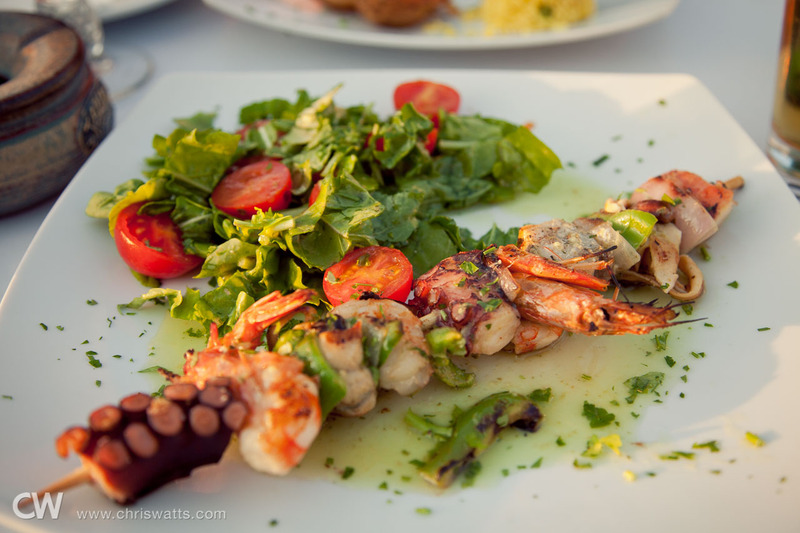 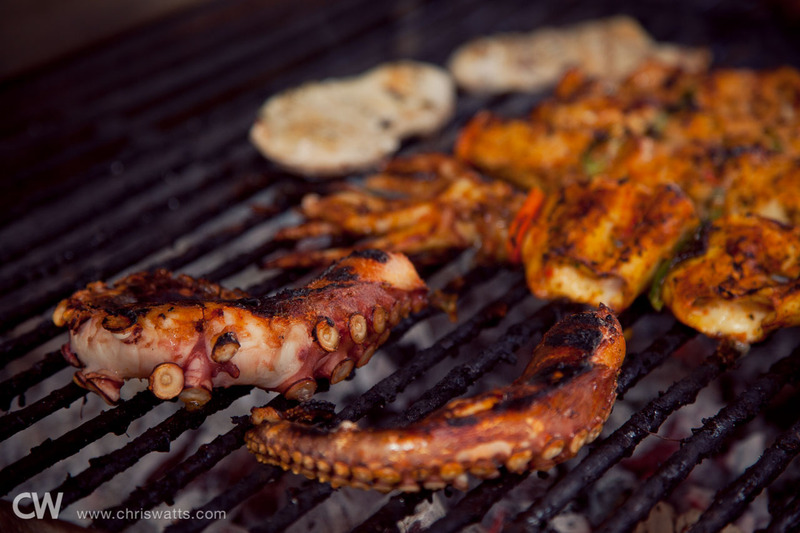 The grilled octopus was excellent! 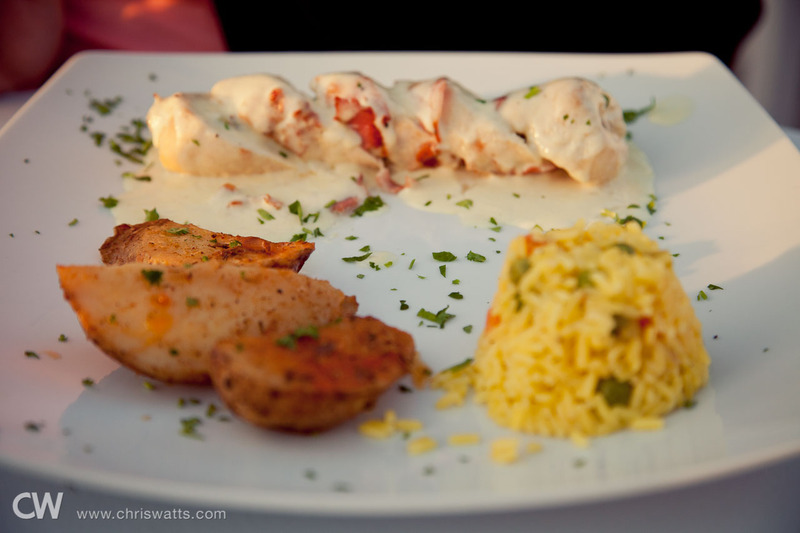 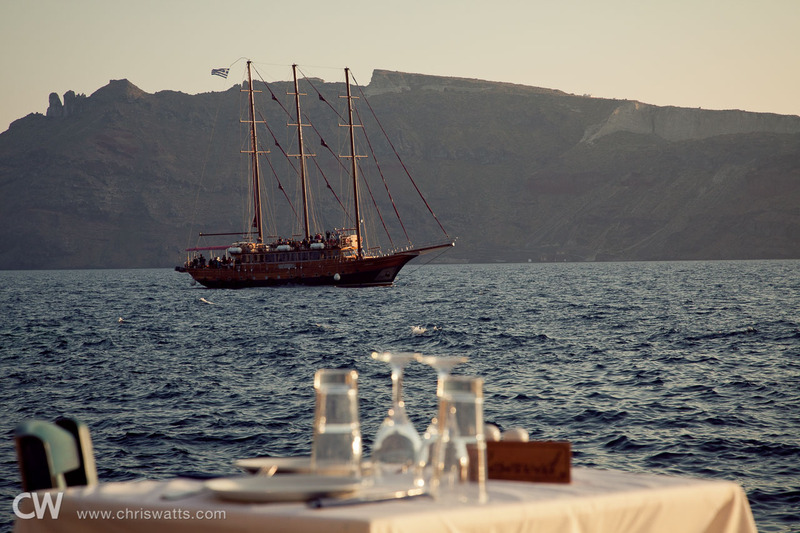 Later that night, we enjoyed a romantic dinner overlooking the caldera just a short walk from our hotel. 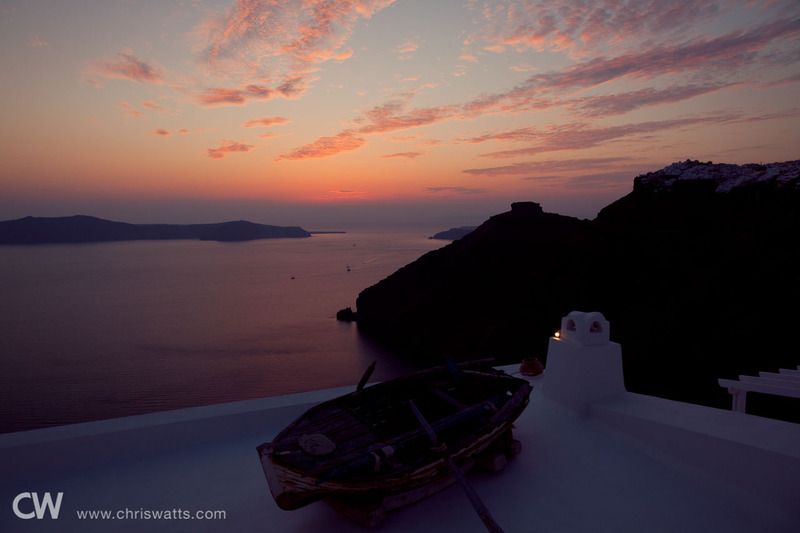 As we enjoyed dinner, we were treated to the sunset we were hoping to see in Oia the night before. 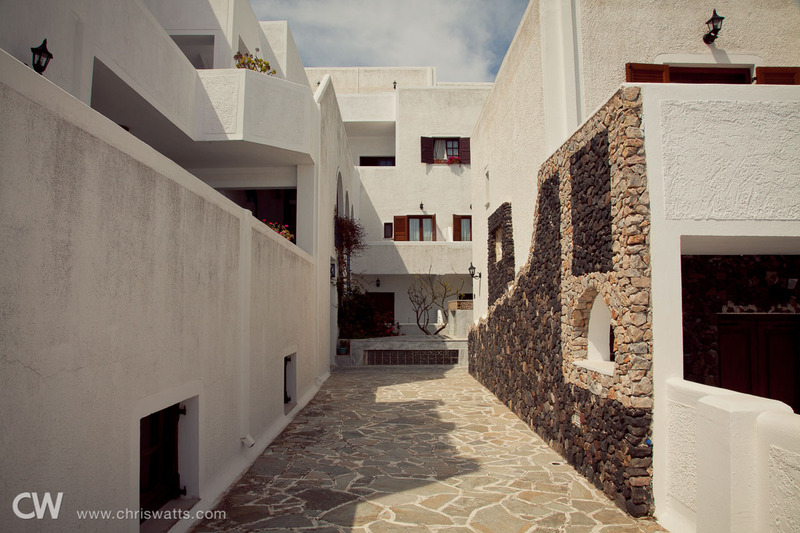 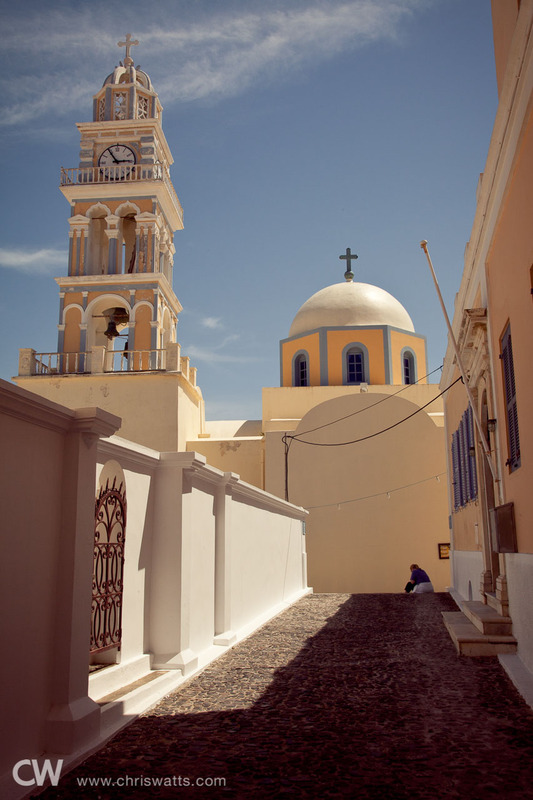 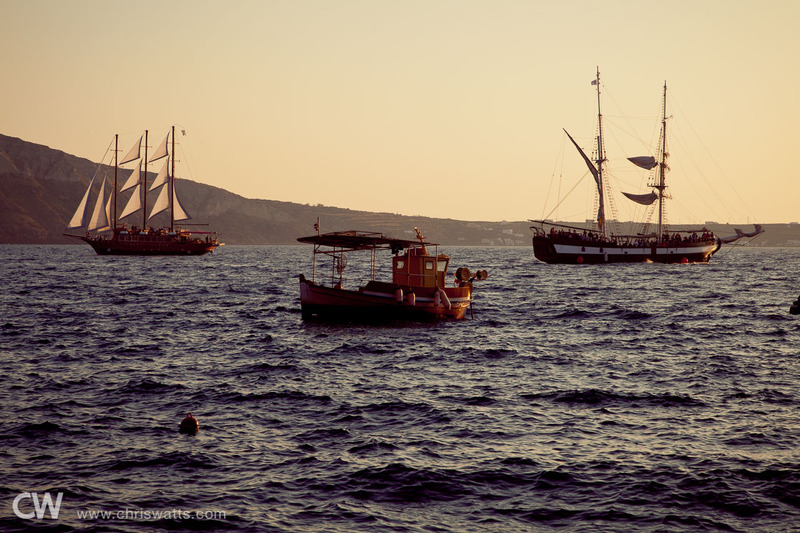 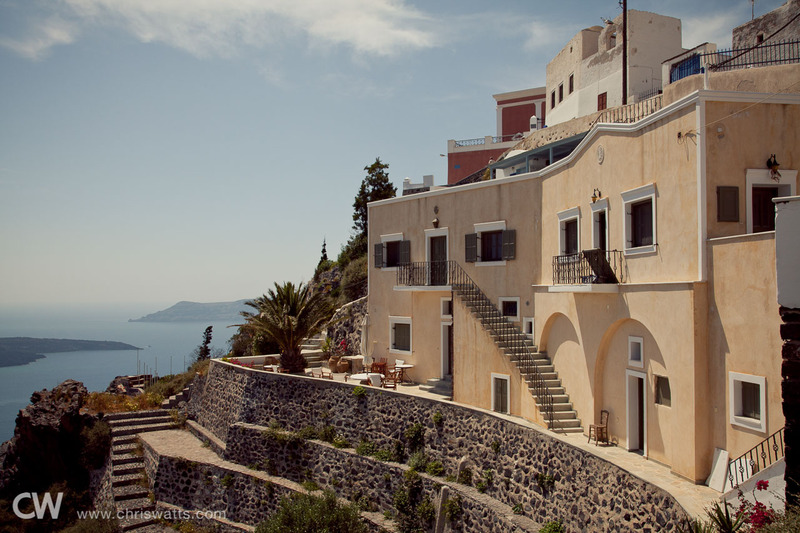 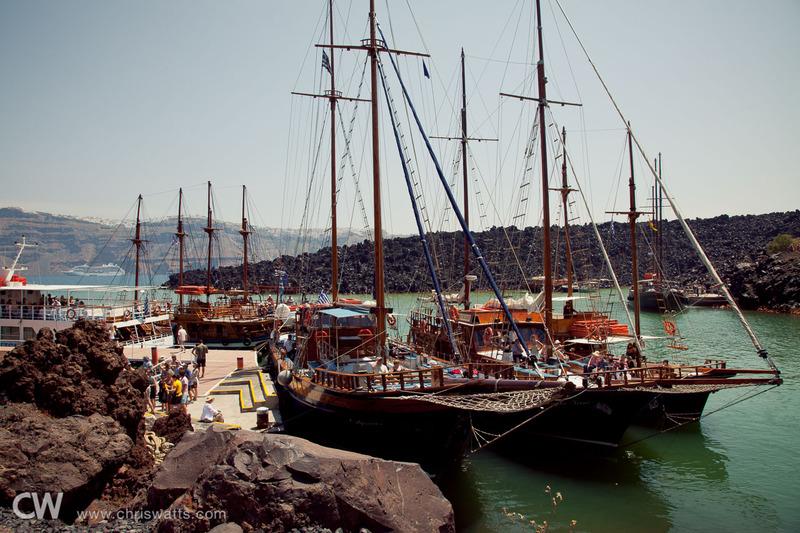 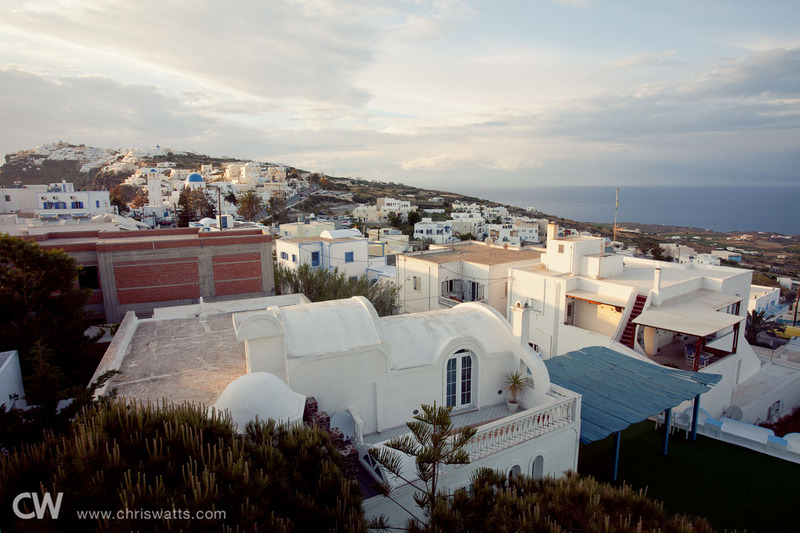 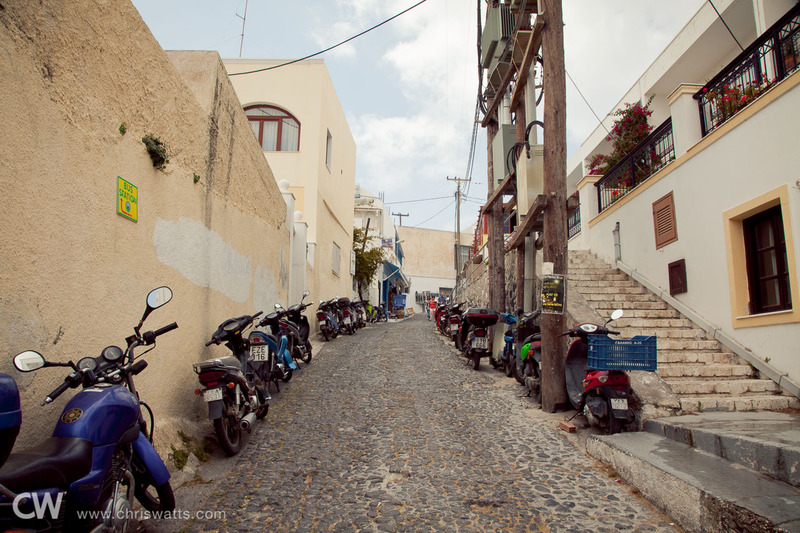 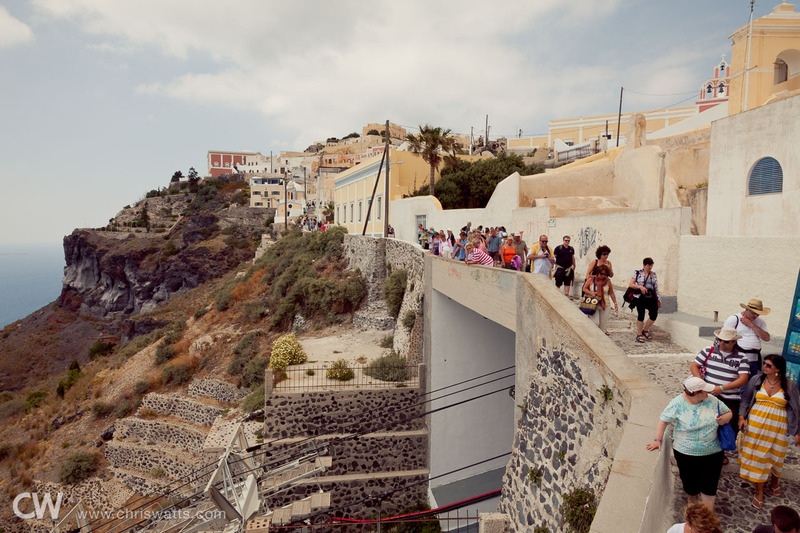 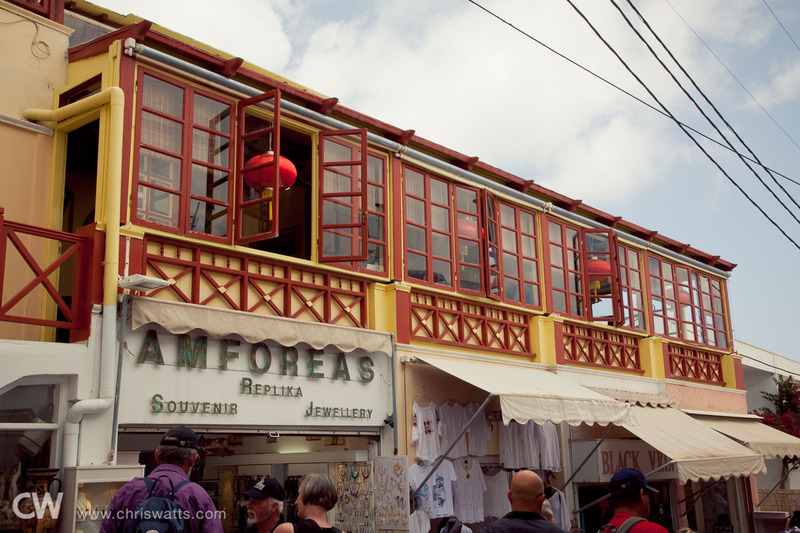 The following day, our last in Santorini, we spent exploring town on foot. 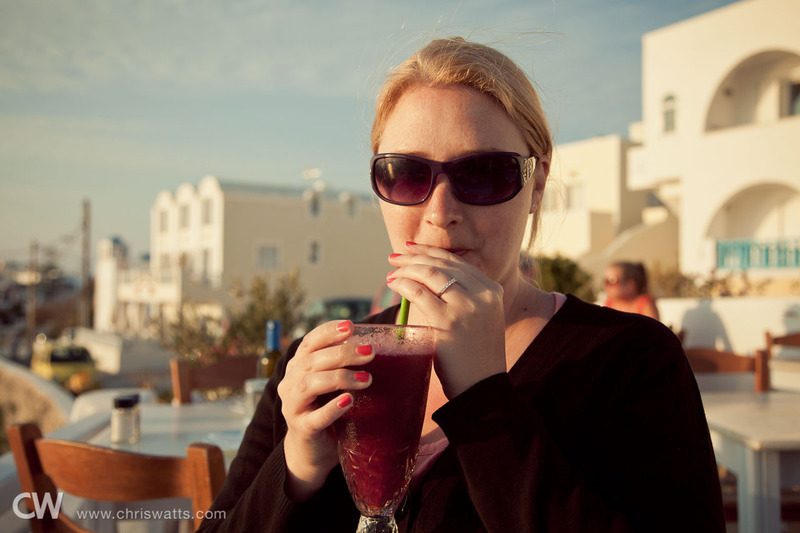 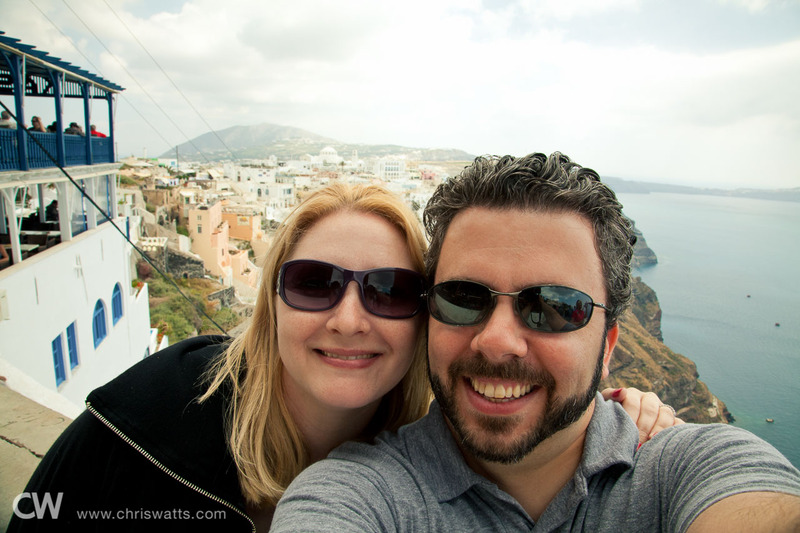 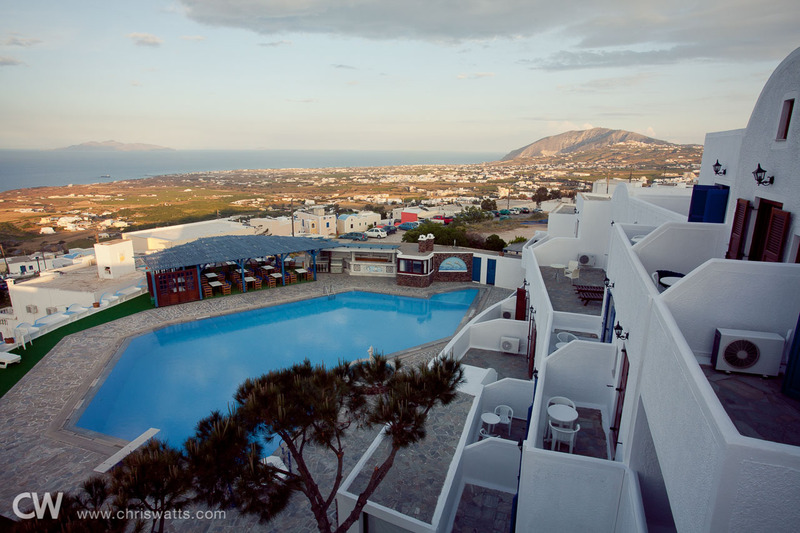 Continue to part 4 of Our Honeymoon In Greece - Crete.